My first memory of running – as a pre-determined activity as opposed to just moving as quickly as possible in between self-inflicted injuries as a child – was with my Dad, running around Thorpe. We lived there from when I was less than a year old until I was 11. My Dad, who had smoked all his life, had decided to give up after my sister came home from school one day in tears saying “Daddy’s going to die!” having learned about the dangers of cigarettes. Pretty much overnight, he quit the fags, started chewing Orbit and started running. One day when I was about 6, I went with him. I remember his white leather trainers which had red and blue stripes on the side. I thought they were cool and decided I’d get some just like that when I was big enough. We did a lap of Thorpe, passing the village hall, the pub and ‘the Poplars’, a tree-lined avenue near the local primary school. I’ve no idea how far it was or how fast we went but I do recall thinking it was fun and easy. 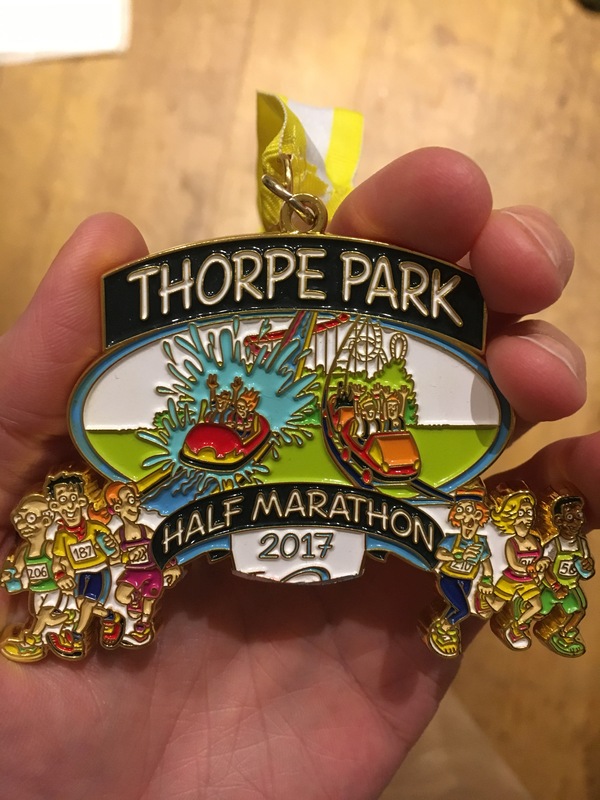 Fast forward 30-odd years and I found myself back in Thorpe, looking forward to another fun and easy run at the inaugural Thorpe Half. 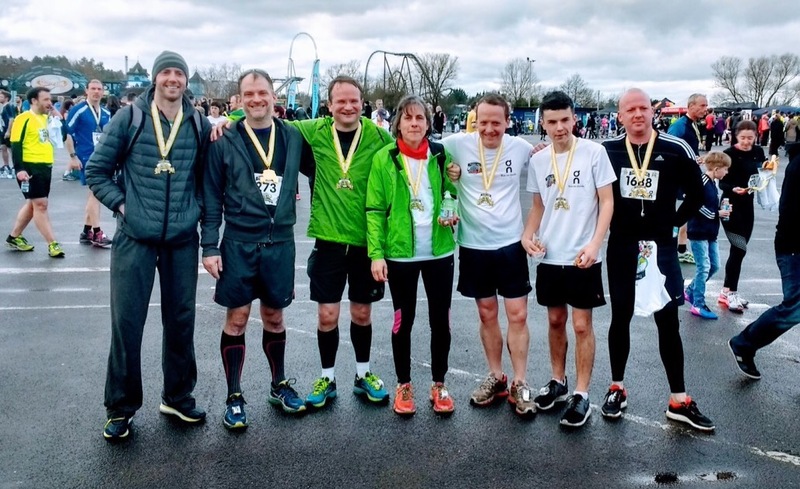 I hadn’t planned to run it – it’s not exactly local for me anymore – but after a cold had prevented me from doing the Hampton Court Half the week before, I’d managed to get a late place. I hoped my fitness was still there, despite a week of sniffling and moaning. Either way, it would nice to see some old sights and catch up with school friend Oli who was also running, mainly because it was local for him. A: Sub-1.35. Ambitious but maybe not impossible. B: Any PB. Really the minimum I expected of myself. You may have noticed the parenthetic ‘park’ in the title of the post. More on this later but the race did start and finish in the Thorpe Park car park, despite the fact the park itself is closed for winter at this time. Even without the joy of having a go on a rollercoaster, it was nice to be back – like hundreds of other students, I’d worked there over the summers of 1992-94. Happy days. Finding my way to near the 1.30-1.40 area, Oli and I set off and within 50 yards he’d stopped to do up his shoelace so I pressed on. 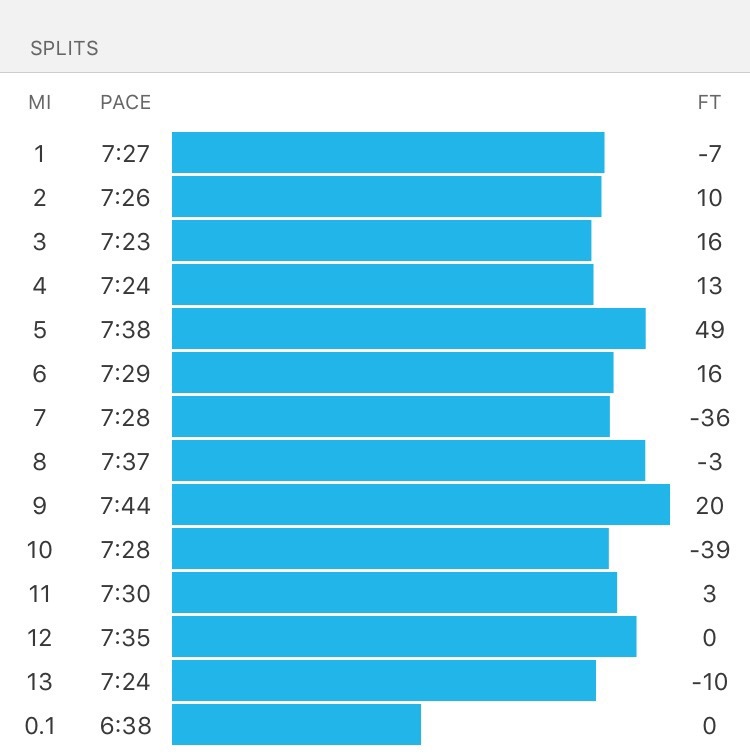 With a target pace of 7:15 minute miles, the plan was to start at 7:30s for the first three miles and then pick it up if I was feeling good. As usual in the first 800 metres people sprinted and elbowed their way past like Arnie in Jingle All The Way. One muscular chap was puffing and panting and I wondered how long he’d keep that pace up before fainting through hyperventilation. After less than a mile we were clear of the park’s service roads and onto the local roads of Thorpe. I could see a road that I knew would take me past the village hall and past the pub but we went right before that and away from the village. I’d found a comfortable pace and thought more about my youth, climbing up trees, listening to the Top 40 on a portable radio and completely by accident finding a discarded copy of ‘gentleman’s’ magazine Mayfair, which in retrospect I really shouldn’t have even touched. Yeuch. By mile 3 we were heading resolutely away from Thorpe along a road I half recognised and then realised we would soon be going up a hill past what I believe used to be Holloway Sanitorium. 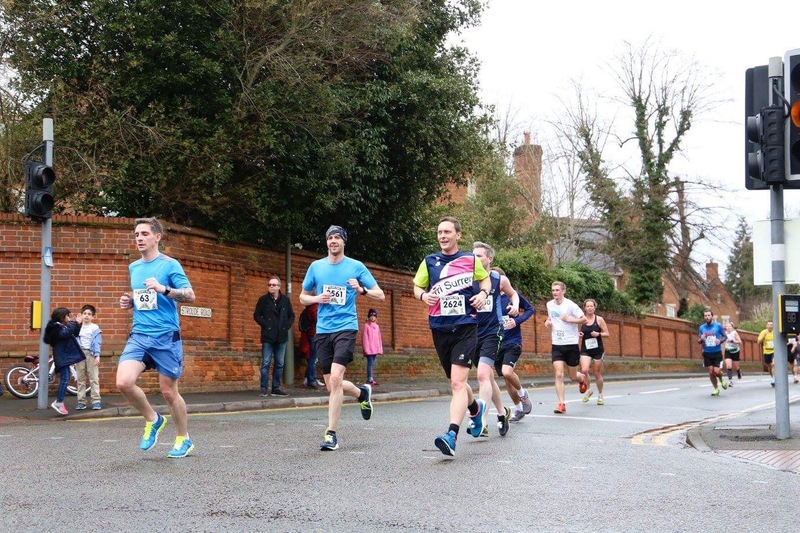 This was the point at which I had intended to speed up but even in the first few miles my legs were feeling heavy and that early race sprightliness simply wasn’t there. I hoped it would pass and pushed on up the hill. Down the other side wasn’t much better and after some flat country lanes through a part of Lyne I didn’t recognise, we reached the 10k mark. It was about 46 minutes and there were no signs of me feeling any better. I was caught by another heavy breather and wondered if there was something in the air today that was causing all of these noisy runners. After a fairly uninspiring section by the motorway, I could see the 8-mile sign in the distance. I told myself that if I could get in under an hour I might still be on for a PB. As I passed it my watch read 59:58. I figured if I could get through the uphill section to follow I’d be okay. I turned left onto the road next to Thorpe Green where I’d once poleaxed my Dad with a cricket ball which hit him square on the kneecap. There was no sign of any cricket today, just the faster runners going in the opposite direction and heading back towards the finish. Past The Rose and Crown, then up the hill, then up a bit more past St Ann’s school where my sister went, and there was the turnaround point. It was all downhill (or flat) from there so I decided to push on as much as I could while I had gravity on my side. Down the hill, through the final water station and back past the green with just a parkrun to go. With around 1:15 on the clock, breaking 1:39 was going to be a challenge. Whenever I get in this situation, I always think I’m going to feel great because I’m fitter and the PB will be a breeze. And then, as I grind my way through the last few miles I remember that getting a personal best means literally doing your best and sometimes that is simply being tougher and stronger and more determined than ever before. Finally I’m into the last mile and I try to pick up the pace but I’m running through treacle and there’s another turnaround point up ahead and the service lanes before the finish. I push and push and push and eventually the finish line appears and I’m done. Over a minute better than my previous best and yet it didn’t feel like it was my best effort. But I guess it was on the day. It may seem ungrateful to not be happy with a PB but as Geoffrey Mutai says in Ed Caesar’s excellent book Two Hours: The Quest to Run the Impossible Marathon, “It is possible to feel two things.” Proud but still disappointed. Still, there would be another chance for a better time in the future. You may notice that the bottom of it it looks a bit, er, filed down. Well, apparently the organisers didn’t get permission to use the Thorpe Park logo in time and this is the result. Personally, I’m not bothered but some people were a bit angry. There were also complaints about cars on a closed-road race (I did see a couple but I don’t think we were in danger), the course not being flat as advertised (fair enough) and queues to get out (I walked so I didn’t see this). However, from my perspective, it was a pretty smoothly run event with good marshals and free race photos so I’d recommend it. Finally, while I’m not getting a lot faster, I am getting better at pacing. So for that, I am pleased.